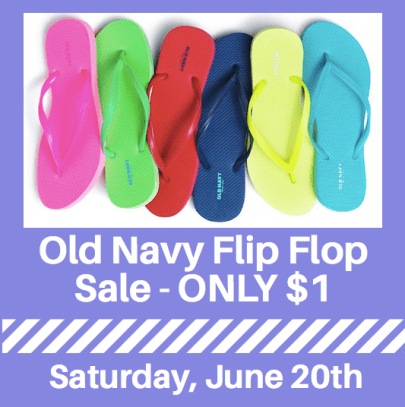 Saturday, June 20th only, Old Navy stores will be hosting their very popular $1 Flip Flop Sale where all solid-colored flip flops will be on sale for only $1! And what’s better than $1 Flip Flops? How about FREE Flip Flops?! 😀 Through June 20th, head on over here to play the Old Navy Emoodji Instant Win Game and Sweepstakes for a chance to instantly win FREE Old Navy Flip Flops (10,006 winners!). Head over to Hip 2 Save to find out more about this sale. Previous post: FREE Kindle Home & Garden Downloads – Please feel free to share!